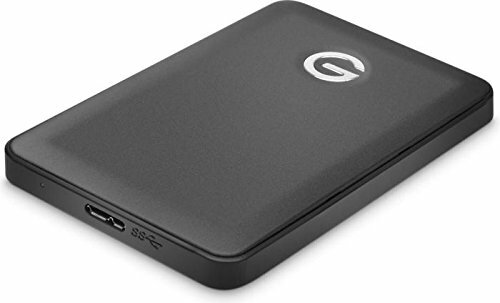 G-Technology G-DRIVE Mobile USB-C Hard Drive 1TB (GT0G05449) - 1TB Storage Capacity - USB Type-C and USB Type-A Connectivity - Up to 130 MB/s Data Transfer Speed - Two Types of USB Cables Included - Bus Powered - Supports Time Machine & File Vault - Aluminum Case - Plug-and-Play - Preformatted for Mac 10.10+ - Windows Compatible with Reformatting The G-Technology G-DRIVE portable hard drive offers a USB-C port for speed, a sleek design, and Time Machine compatibility. Inside its thin, beveled-aluminum case there's a high-performance 7200-rpm hard drive with plenty of room for storing your video and photo files. It's easy to set up and bus-powered, so there's no need to carry an external AC power supply. Toss it in your bag and you're ready to go.